Wow. So, apparently Time has ended. It's been a wild ride for a really long time, but I guess it had to end sometime. No, I'm not referring to Doctor Who (although I do see the confusion). I'm referring instead to XKCD comic number 1190, titled Time. If you haven't heard of it, here's just a brief rundown of what it is, and why you should care. Let's start with what XKCD is, shall we? In 2005, a guy by the name of Randell Monroe started publishing his comics that he drew in his spare time on the internet under the name XKCD. At the time, he was a scientist working under contract for NASA. The comic drew attention for itself not only for its sharp wit and simple art style, but also for its very intelligent writing. The banner for the site proclaims it as "A webcomic of romance, sarcasm, math, and language." Not all of the comics are written for comedy's sake; many of them are simply massive charts of fascinating information (such as a map of the internet if sites were landmasses). It updates every Monday, Wednesday, and Friday. Time is the name of comic 1190. It started out simply enough: two people sitting on the shoreline with the tagline reading "Wait for it...". Half an hour after people started waiting for it, the image suddenly changed. It was now two people sitting on the shoreline. The same two people in fact, but they had moved a little bit. For the first five days, it continued to update every half hour, totaling 240 frames. On day 6, it switched to updating every hour, but it never took a break. So why does this matter? Well, simply put, it captured the imagination of the internet. I don't think that anything of this sort has really been tried before. 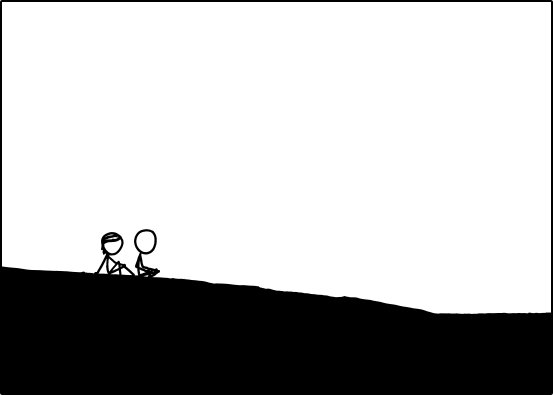 It was also a first for XKCD, because it told a long-form, cohesive story over its run. Usually his panels are simple one-off gags, but this was all one story. Perhaps the most incredible part was how Monroe managed to keep updating the main site with new comics on every MWF while this was still going on. But if you really want to see the impact of this comic, go check out the thread on the official forum or the wikia site devoted to just this comic. At the time of this writing, the thread has 51,466 51,473 51,488 posts on it, and it just keeps growing. I looked at some of the posts near the end, and they were made by some devoted fans, let me tell you. They were using acronyms for things that I had no idea about (although I did figure out that OTT is "One True Thread"), and talking about "The Event," which I assume is the end of Time, not the canceled TV show. The wikia site on the other hand, has 1,260 pages on it. All for one comic! That's not the wikia for XKCD as a whole; that's just for Time. The depth that they go into... Under the section on the One True Thread, you can find a subsection called "Religion of the One True Comic." They formed an entire faux religion around this one comic, with numerous denominations and belief systems! How does that even work? Anyhow, I immensely enjoyed following this comic. If you want to give it a read (you really should at least check it out), you can view the whole thing here, or there's a link from the official page on XKCD itself. After you finish, I'd recommend that you check out the wikia page on the location of the comic. It may help clear some things up for you.